Loaded BLT Egg Salad - Wellness & Healthy Living - Recipes, Blogs, Podcasts & Books | Fed & Fit - A creamy and flavorful spin on a classic! 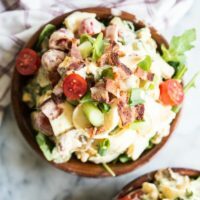 A unique spin on a traditional egg salad, the perfect lunch meal! Make the dressing in a small bowl by whisking mayo and dijon together until fully incorporated. Place all remaining ingredients in a large mixing bowl and then add dressing. Mix well to make sure all ingredients are combined. Keep refrigerated in an air tight container until ready to serve!